The Midtown hillbilly chic establishment shines a light on the taste and quality of their line of organic and local craft spirits. Learn more about their spirits here. In Grand Rapids there are a plethora of breweries and brewpubs that have found great success. For Gregg Palazzolo and Robert Grimes, owners of Flat Lander's (855 Michigan St NE), they are hoping the same rings true for distilleries, or in their case, Barstilleries™. Barstillery™, a term actually trademarked by Palazzolo and Grimes, essentially means that, along with the usual bar fare of local beer, wine and food, Flat Lander's creates their own line of craft spirits with the help of Journeyman Distillery. 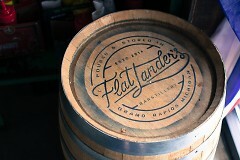 The only one of its kind, nothing is usual about Flat Lander's. Same can be said for their approach to craft spirits. “Bill Welter [of Journeyman Distillery] is the artist behind the making of the product. We sit down and talk with Bill and experiment with recipes and he helps us create a well rounded offering of spirits specific to Flat Lander's,” says Palazzolo. Currently their line of spirits include white whisky, gin, vodka, bourbon and rum. Grimes and Palazzolo are now working with Welter to introduce both a spiced rum and a tequila to their repertoire in time for their first anniversary this March. At the end of the day, all the products used in the construction of their spirits are sourced locally. Being an establishment focused on local and organic practices mattered greatly to both Grimes and Palazzolo when they approached Welter regarding distillation. Journeyman Distillery, located in Three Oaks, Michigan, is a USDA certified organic distillery. Not only do utilizing organic grains create the highest product for a distillery, says Welter, but Michigan in itself has a wonderful source of natural ingredients, specifically the fresh water. “Some of the best beers are coming out of Michigan and we think we can make some of the best spirits in the world due to the abundant natural resources.” he explains. “Here in Three Oaks, we have untreated water coming straight from an aquifer that provides us with a clean water source that is untainted, which goes hand in hand to create high quality spirits.” Due to the unique water source in Three Oaks, Journeyman does not have to spend time or money attempting to filter out the chlorine, flouride or ozone found in treated water. They start from scratch with the cleanest and purest form of water. Currently Flat Lander's sources their line of spirits from Welter, but Grimes and Palazzolo are working to make the vision of having their own distillery as well as more Barstilleries™ a reality. After not even a year of trial and error, it appears the Flat Lander's has hit that right formula. Palazzolo and Grimes say they love getting to know the patrons, from ages 21-91, and hearing their stories. “I wish I could sit down and talk with everyone who walks in the doors and hear about their experiences,” says Palazzolo. Grimes says those conversations are how their business can continue to improve. “I want people to share their thoughts and experiences because from that we are going to grow,” he says.